1.125 IN. DROPPED DRIVESHAFT: Like the 2017 Mountain Cat, this 2018 M 8000 Sno Pro is fitted with the 1.125 in. dropped driveshaft. The increased track-to-tunnel clearance of 3 in. allows us to use 8-tooth drive sprockets on this model, giving you a flatter approach angle with more floatability and maneuverability. In addition, you’ll also notice a huge difference in your sled handling. 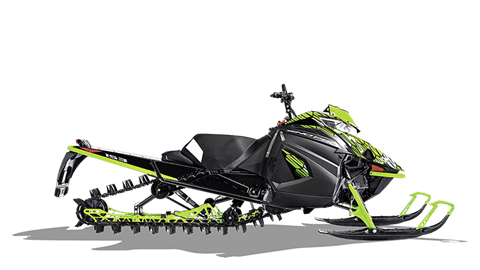 This update delivers a more efficient power transfer to the snow, letting you enjoy more horsepower when climbing, carving, sidehilling and boondocking. ARCTIC MOUNTAIN FRONT SUSPENSION WITH FOX FLOAT 3 SHOCKS: Lightweight, forged-aluminum spindles have less surface area than the previous design, reducing drag and improving performance in deep snow. Also, dual-phase high strength alloy-steel A-arms are lighter than previous designs. FOX FLOAT 3 air shocks are improved for 2018 with improved ride and handling – with more supple compression in the initial stroke travel – thanks to increased volume on the ski shocks via a new body cap and shorter negative spring. FLOAT-ACTION REAR SUSPENSION WITH FRONT ARCTIC CAT IFP AND REAR FOX FLOAT 3: Thanks to increased shock length from 16 in. to 17 in. on the rear arm shock, the FOX FLOAT 3 air shock provides smother compression in the initial stroke travel. The FLOAT-ACTION rear suspension’s unique tri-hub rear axle system provides a better ride quality in all conditions. ARCTIC DRIVE SYSTEM WITH TEAM DRIVE AND DRIVEN CLUTCHES: The Arctic Drive System features TEAM Rapid Response II drive and Rapid Reaction BOSS driven clutch combination for smooth shifting, optimal performance, maximum durability; great serviceability; and reduced weight. The new Rapid Response II drive clutch features a roller bearing on the shaft that enables an autoadjusting belt tension design and delivers consistent performance without manual adjustments. 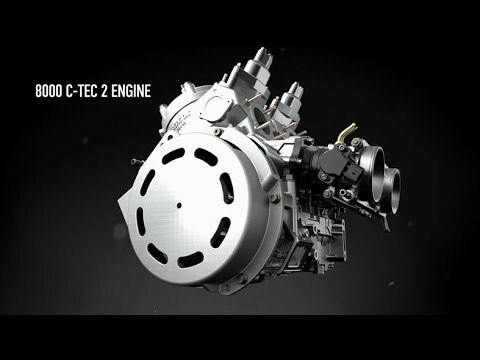 It also features a 12.5 percent lower effective starting ratio (while maintaining the top ratio) for smoother engagement and reduced belt wear at drive-away speed, with more evenly distributed force for lower belt pressure. It’s a design that’s unique to Arctic Cat. 153 IN. & 162 IN. POWER CLAW TRACK WITH 3 IN. LUGS: This lightweight, single-ply track with a 3 in. pitch sets the standard for deep snow performance. Stagger-set, curved-forward paddle towers won’t fold over. The new industry-leading 3 in. lug grips the powder like no other. Available in 153 in. and 162 in. lengths. PROCLIMB - 7 SKIS: The ProClimb-7 mountain ski is 7 in. at the tip, tapering to 6.5 in. at the center. The wider skis enhance your carving abilities and prevent unintended downhill braking. A wider ski damper featuring a longer axle and bolt increases lateral adjustability. VERTICAL STEERING POST, 4.5 IN. RISER WITH ADJUSTABLE MOUNTAIN HANDLEBAR: Want to counter-steer on steep hills? This 4.5 in. vertical post provides a more natural handlebar turning arc when you’re riding standing up. Overall - 42.5 - 44.5 in. Estimated Dry - 447 lb. 162 x 15 x 3.0 in.